In the summer I just crave healthy, lean foods. It may be because of the heat. It may be because I’m not hiding behind the layers of clothing that I wear in winter that my subconscious is reminding me that fatty foods make for a fatty Kari! Pork is a lean protein. Somewhere along the way pork was labeled bad and fatty; I suspect that it’s because pulled pork and pork belly are all the rage in the culinary world at this time. 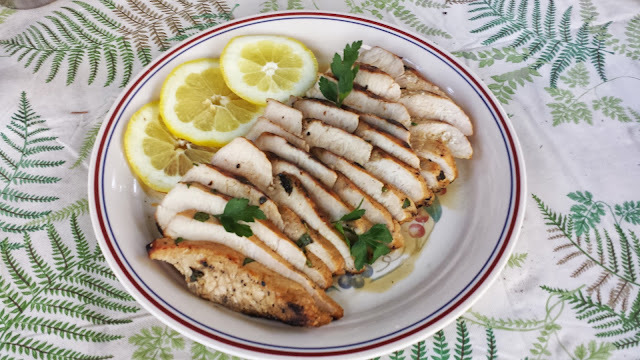 There are cuts of pork such as pork tenderloin or loin chops, that are just as lean as chicken. Mojo marinade (pronounced moho) is a bright citrus marinade that takes to grilling really well. 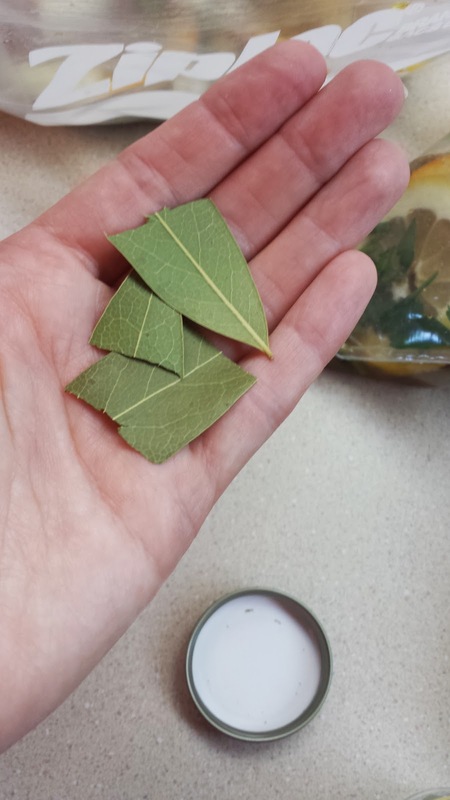 Mojo marinades vary depending upon which region of the world you live in. Because I live in South Florida, I am influenced by the Latin versions which uses sour orange. Since sour orange isn’t readily available in most parts of the continent, I used a combination of navel oranges and lemons to achieve a similar flavor. Y’all know that I’m kinda lazy, so I cut a larger piece of pork in two and marinated it. I grilled half the first night, to enjoy for dinner; and a couple of days later I grilled the remaining half to make yummy sammies…one recipe, two dinners! Start by removing any silver skin from the pork. Season all sides of the pork with seasoning salt, garlic powder and pepper. 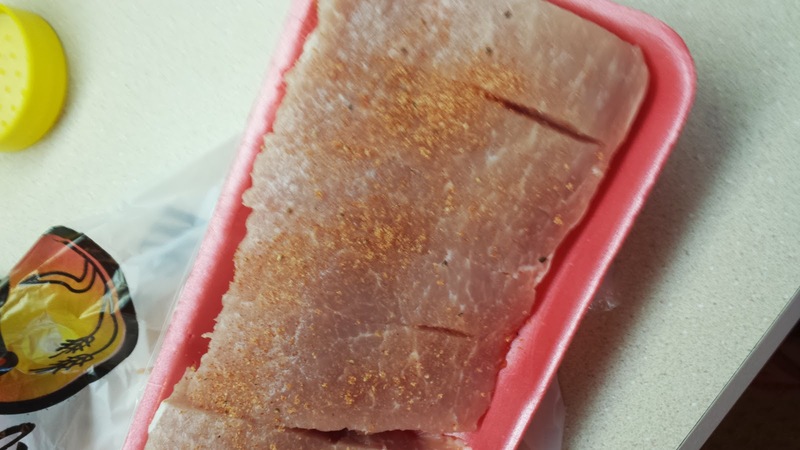 I cut this long piece of pork in half so that it would fit into two ziploc bags. Let it hang out while the marinade is prepared. 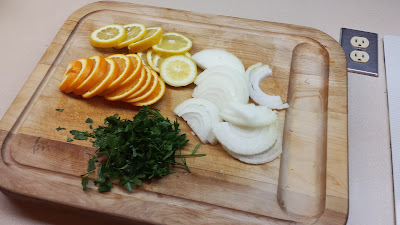 Slice the aromatics; onion, orange, lemon and flat leaf parsley. 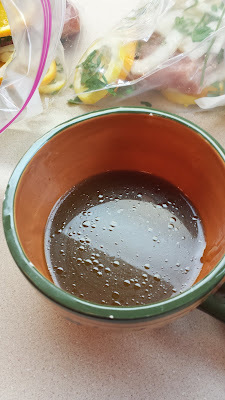 In a small bowl mix together some orange juice, worcestershire sauce, honey, and a few dashes of tobassco. Add half of the aromatics to the bottom of two ziploc bags, place the pork on that, then add the remaining aromatics. Break two bay leaves in half and add two halves to each bag. 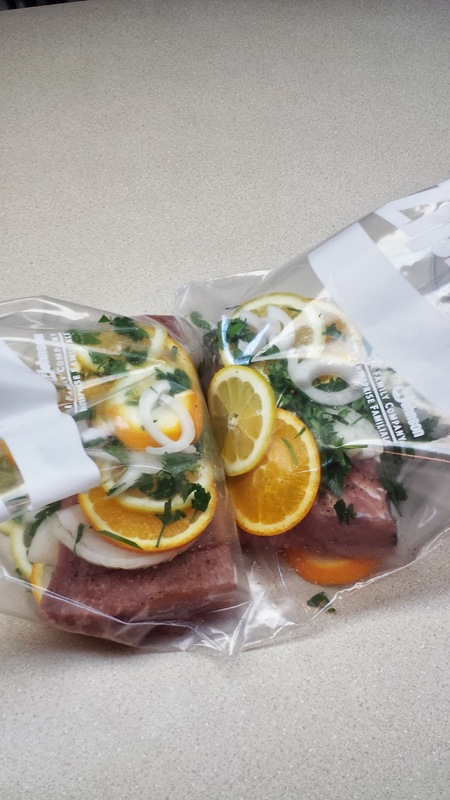 Pour the half of the marinade in each bag and zip the bags up, squeezing out any excess air. It's not totally necessary but I like to press the bag to break up the little juice pods of the citrus. Marinate the pork in the refrigerator for at least 2 hours, over night is even better. Remove the marinated pork from the refrigerator about 15 minutes before cooking. Take it out of the marinade and blot off the excess marinade. Start the grill on high heat, when the grill is hot add the pork and turn the flame down to medium-low. Cook for 10 minutes on the first side, and about 8 minutes on the second side; until the pork reaches an internal temperature of 145 to 150 degrees. Pour the marinade into a sauce pan. Bring the marinade to a boil, and then turn the heat down to medium-low and cook it for 20 minutes. Remove the cooked pork, cover it with foil and allow to rest for about 10 minutes before slicing. Strain the cooked marinade into a bowl and discard the solids. Pour a little of the marinade over the pork slices and serve the remaining marinade on the side. I only cooked half of the pork and served it with some lovely grilled corn and a crisp salad. I grilled the other half of the Mojo Marinated Pork a couple of days later and made a really yummy sammie! Start by making the Spicy Red Cabbage Slaw. In a medium bowl add shredded cabbage, really finely sliced onion, and thinnly sliced jalapenos which are de-seeded. 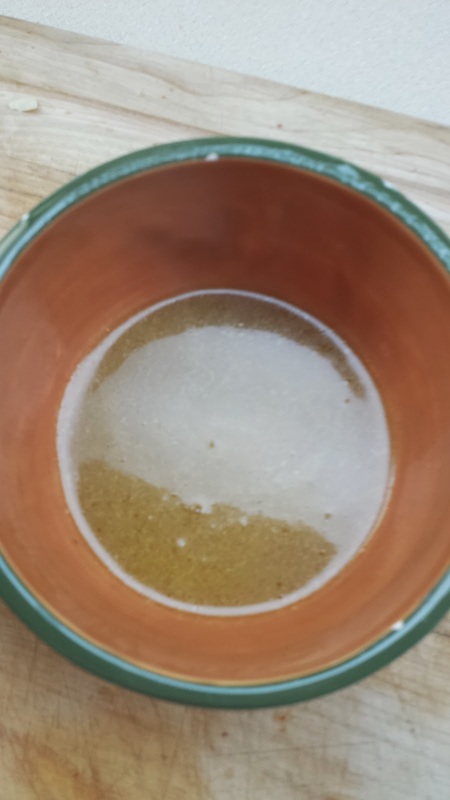 In a small bowl mix together some mayo, dijon mustard, freshly squeezed lemon juice, apple cider vinegar, honey, ground cumin and ground coriander. Pour the dressing over the shredded veggie and toss to mix. To make the pork sandwich you will need: Mojo Marinated Grilled Pork, Spicy Red Cabbage Slaw, sliced avocado and some Naan bread (though pita bread of your favorited roll will be just as great). I served this with more sweet summer corn (cuz I just can't get enough of it) as well as sliced tomatoes and cucumbers. 1. Remove the silver skin from the pork with a sharp knife; if necessary cut the pork in two so that it will fit into 2 gallon sized Ziploc storage bags. Season all sides of the pork with the granulated garlic, seasoning salt, and pepper. 2. 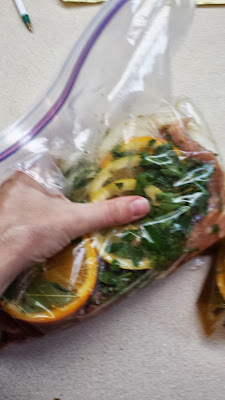 Divide the remaining ingredients between 2 gallon sized Ziploc storage bags. Add the pork to the bags doing your best to have the marinade on all sides of the pork. Squeeze the excess air out of the bags. 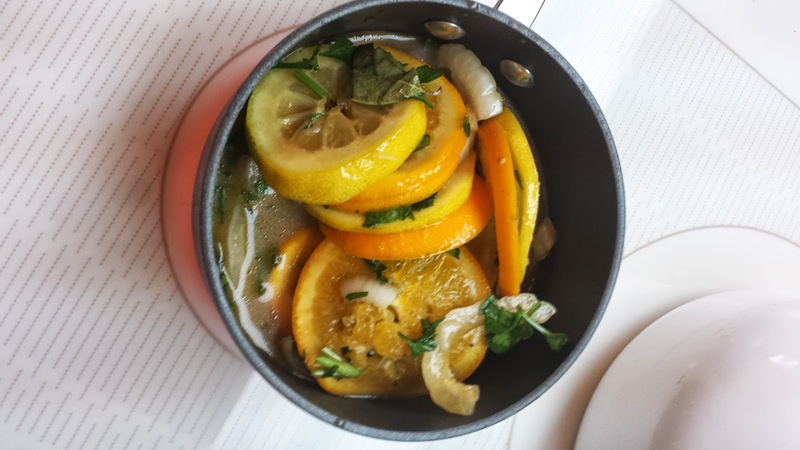 Give the bags a little squeeze to break the juice pods of the fresh citrus. Refrigerate for at least two hours, overnight is even better. 3. 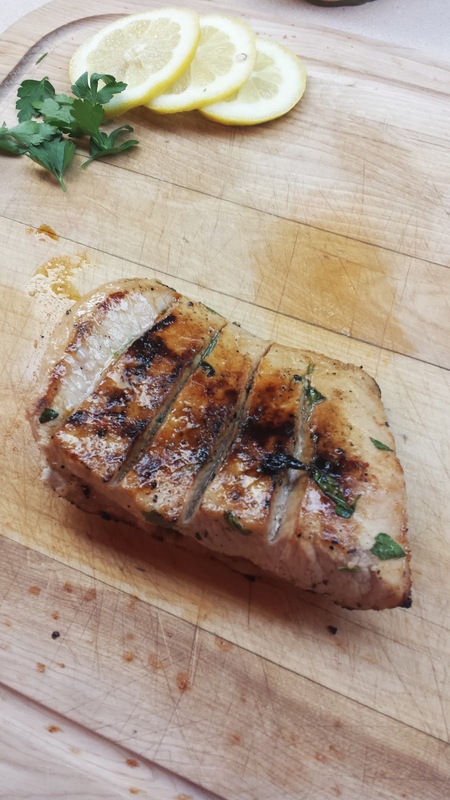 Remove the marinated pork from the refrigerator 15 minutes before you’re ready to grill. Remove the pork from the marinade and blot the pork with a paper towel. Get your grill good and hot, add the pork to the grill and turn the grill down to medium-low. Cook for 10 minutes on the first side and about 8 minutes on the second side, until an internal temperature of 145 to 150 degrees. Remove the grilled pork to a platter and cover with foil to rest for 10 minutes before slicing.4. Meanwhile, add the marinade to a sauce pan, bring to a boil, then reduce the heat to medium-low and cook for about 20 minutes. 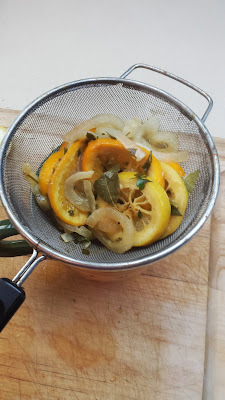 Pour the cooked marinade through a strainer into a bowl. Discard the solids and serve the marinade over the cooked pork. Note: You may also use this marinade for pork chops or chicken. Spicy Red cabbage slaw, recipe follows. 1. Lay a little slaw on the bottom of a piece of Naan bread, top it with a few slices of pork, a few slices of avocado and finally another piece of Naan bread on top. Note: This also makes great pita bread stuffing or just use your favorite rolls. 1. Add the cabbage, onion and jalapeno together in a medium bowl. 2. In a small bowl stir together the mayonnaise, lemon juice, honey, apple cider vinegar, cumin and coriander. 3. Mix the dressing into the shredded cabbage mixture. Cover and refrigerate for about 30 minutes. OHHHHH that marinade looks so good! 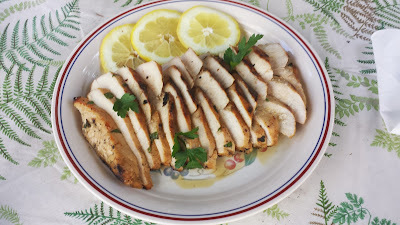 Whenever I have the time and forethought, I LOVE using marinades and am always looking for a great recipe. SCORE! My bf's alllll about pork, so he'll love this! Thanks Julia. I think your BF will love this marinade for pork, but I forgot to mention that it's also great for chicken! 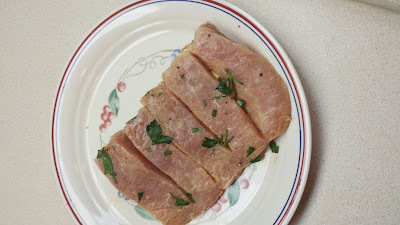 I grew up in South Florida where a good "mojo' marinade was a must for pork. Yours rocks. Thanks Velva, I feel validated,this coming from a South Floridian! This marinade sounds terrific. Beautiful dish and we love good moist pork. Bravo!